Hillary Clinton stood on stage during a campaign stop in Louisville, Ky.
“People say, ‘Maybe he doesn’t really mean it,’ ” Clinton told a room full of supporters on a recent trip to Louisville after ticking off some of Trump’s banner insults. “When you are running for and serving as president, you better mean what you say!” she concluded to cheers. Hillary Clinton is making a big final push in Kentucky where rival Bernie Sanders hopes to extend his winning streak. Read: Do Clinton backers lack enthusiasm? If that’s true, she yelled, “Deal. Me. In!” — motioning for everyone to say the phrase with her in unison. Polls show Clinton to be unexpectedly strong against Trump in a slew of usually Republican states that Democrats wouldn’t typically touch. In Arizona, which since 1952 has only once voted for a Democrat for president, Clinton held a 7-point lead in one recent poll. In Georgia, the two candidates were statistically tied, according to one poll. It’s early evidence that a general election matchup between Clinton and Trump would scramble the electoral map so intensely that outcomes once considered laughable are worth thinking about. Both candidates are well known to voters and both have high unfavorability ratings from voters, particularly in the swing states of Florida and Ohio. When strategists look at the Electoral College map, they see evidence that Trump could be competitive in states that Democrats typically win. 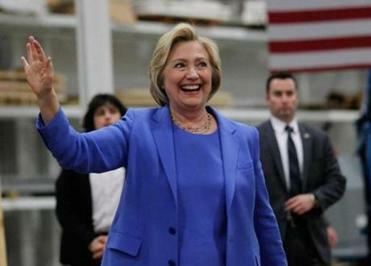 Public opinion polls show he is running neck-and-neck with Clinton in Pennsylvania, a place that he must win in November if he begins losing the typically red states. He does poorly with nonwhite voters, but his overwhelming support with white men means he remains competitive in Florida, a notion that Democratic strategists once considered impossible. In that state, he has an opening because only 25 percent of white men support Clinton, according to a new Quinnipiac poll. Clinton has a unique opportunity to peel off the support of Republican women, said Christine Matthews, a Republican strategist in Virginia whose company helps candidates target female voters. Indeed, during one rally in Louisville, Clinton, literally, went nuclear, reminding voters of Trump’s comments that he saw benefits in allowing Japan, Saudi Arabia, and South Korea to acquire destructive weapons the United States has long tried to contain. 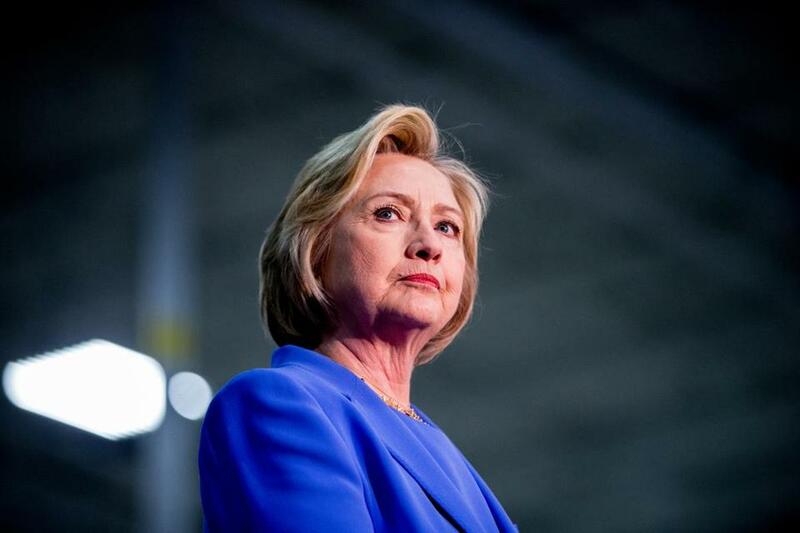 The strategy, anecdotally at least, revealed some glimmers of success for Clinton. Clinton’s audience last week included self-described Republicans who came to take a closer look at her, and left ready to support her in November. “I just can’t stomach what’s happened to the [Republican] Party,” said Moses Cordero, 66, a Republican who decided to attend the Clinton rally after he heard Trump blame her for Bill Clinton’s infidelity. Trump narrowly won Kentucky on March 5 when Republicans held their caucuses. He took 36 percent of the vote. Senator Ted Cruz, the Texas Republican who recently dropped out of the race, had 32 percent. Some of these voters hear Clinton’s message and believe it’s actually closer to the GOP candidates of yesteryear that they’ve supported. “If you’re looking for a moderate Republican, Hillary is the candidate for you,” said Meghan Levins, 34, who voted for Mitt Romney in 2012, but proudly wore a pro-Clinton sticker with a blue “H” at a rally. In addition to Hillary Clinton’s multiple trips to the state in recent days, Bill Clinton campaigned in Kentucky on Thursday. He won the state twice when he was running for president in the 1990s. The state won’t be in play in November, said its governor, Matt Bevin, a Republican who predicted that the Clintons are wasting their time (but encouraged their team to spend money there). It is home to the Senate’s top Republican, Mitch McConnell, and to Rand Paul, a favorite of the Tea Party movement, and doesn’t provide the kind of racial diversity that bolsters her chances in other conservative states. “Hope springs eternal,” Bevin said in an interview with the Globe about the Clinton travels. Still, even the governor of this deep-red state isn’t quite ready to embrace Trump, an example of the very rift that Clinton’s team hopes it can use to its advantage. Annie Linskey can be reached at annie.linskey@globe.com. Follow her on Twitter @annielinskey. Tracy Jan can be reached at tracy.jan@globe.com. Follow her on Twitter @TracyJan.